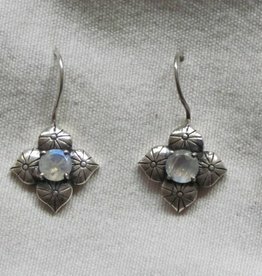 Silver earring set with a facet cut rainbow moonstone surrounded by decorative silver work. Made by a master craftsman in a workshop with good working conditions in Sitapura Jaipur Rajesthan 2,50 cm long excluding the ear hook. Fairly made with respect for all employees. Earring hand made from silver in Jaipur by a master silversmith in a werkshop with good working conditions. 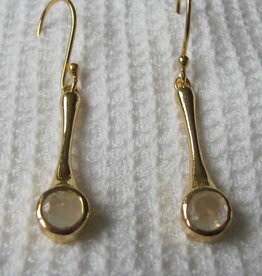 Each earring contains a cabouchon rainbow moonstone. 3,50 cm including the integrated hook. Handmade silver earring with one oval shaped cabouchon moonstone and a teardrop facet cut garnet. 1,50 cm without the integrated hook. 2,5 cm long not counting the integrated ear hook . Tear drop cabouchon rainbow moonstone. Dormeuze model. Material is silver with an electroplated gold layer. 2,5 cm long not counting the integrated ear hook . Tear drop faceted rainbow moonstone. Dormeuze model. Material is silver with an electroplated gold layer. 1,5 cm long not counting the integrated ear hook .Cabouchon rainbow moonstone. Dormeuze model. Material is silver with an electroplated gold layer. Elegant earring 2,5 cm long not counting the ear hook . Faceted rainbow moonstone. Material is silver with an electroplated gold layer.